More than just a profitable venture, this business provides small rural producers the chance to reach a larger market. What makes a good business? Should it be about reaping maximum profits or constant growth and expansion? Or should it go beyond those? 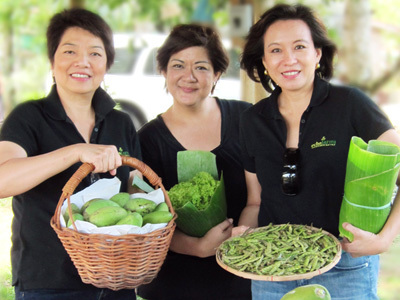 For Chit Juan, Jennie Javelosa, and Reena Francisco, it is about making a business that the people and the community as a whole can benefit from. The three founders of ECHOstore Sustainable Lifestyle--the 'ECHOtrio'--each has their own advocacy in life. Chit, having been involved in various NGOs in her time with Figaro Coffee Co., and Reena and Jeannie, with their background in Philippine culture and the arts, decided to put their respective passion and advocacy together in forming a social enterprise. "The first thing we looked for was our mission," Chit Juan discloses. "There are so many producers [out there] but they have no market access." Small time producers like provincial farmers and indigenous communities, usually have a hard time reaching a wider market due to their remote location, far away from the nation's capital. Also due to their seclusion, a large number of these producers--the indigenous farmers in particular--are unaware of the true market value of their unique and organic products. Because of this, these small-time producers are in danger of being exploited by large commercial distributors who buy their products for a much lower price, leaving the producers under-compensated. ECHOsi Foundation believes that this should not be the case. The products sold at the ECHOmarket are ordered from these small-time producers at a fair price, at the same time providing the producers with guidance on packaging and product presentation to make their products more marketable. One of the benefactors of this program is a 70 year-old woman who sells Guava Jelly made using an heirloom recipe to support herself and her medical needs. "Selling Guava Jelly helps her support herself and buy her medicines," Chit shares. "She makes the jams herself and delivers them herself." The overwhelming expression of gratitude Chit and her partners receive from producers like her shows how much a program like this helps provide income to local producers. Thorough their social programs such as ECHOdesignlab, ECHOteach, and ECHOtalk, the ECHOsi Foundation is able to reach more people. "By supporting such businesses, we're not only preserving the culture of these people, but also helping them live a better life." Putting focus on a more specific group, the ECHOsi Foundation, in partnership with the Philippine Commission for Women (PCW) and under grant from the Canadian International Development Agency (CIDA), started the GREAT Women brand as a livelihood program that aims to empower women businesses from various provinces and sectors all over the Philippines. The GREAT Women brand is dedicated to promoting women products and helping women up the quality of their merchandise for better market competition. The GREAT Women brand carries products that range from Guava Jelly to basket weaves--all produced by women, each with their own story to tell. The execution of the first phase of this program was a big success, with talks of replications by APEC (Asia Pacific Economic Cooperation) and other ASEAN (Association of South East Asia Nations) communities to spread the message of independence and empowerment among women producers.